Aquatic turtles can be great pets, though they're not ideal for young children and do require a good deal of care. Similar to tortoises and box turtles, aquatic turtles can benefit from spending time outdoors in a backyard pond. However, there are some important points to keep in mind. Depending on where you live, putting an aquatic turtle outdoors might be something you can only do for a few months during the summer. You need to consider the natural range of the species you have. For example, red-eared sliders are quite hardy and adaptable. However, some other species need warmer temperatures, so you must keep the natural habits of your turtle in mind when deciding to house them outdoors. In warmer climates, aquatic turtles may be able to live outdoors year round. It is also possible to hibernate some species in an outdoor pond, although this is not without risk. Pet aquatic turtles kept in outdoor ponds do need to have secure fencing. There should be a fence around the pond--at least two to three times higher than the carapace length of your turtle, and sunk into the ground 6-10 inches to make sure there is no chance of escape). The fence should have a solid base so turtles don't get caught up in the wire. This fence is meant to keep turtles in since they will wander in search of a mate, and it also helps keep predators out. You may also want to consider a cover (e.g. chicken wire) over the pond area to protect your turtles, especially if predators like raccoons come into your yard. Hatchlings and small turtles are extremely vulnerable to predators so are best kept indoors until they are a good size. 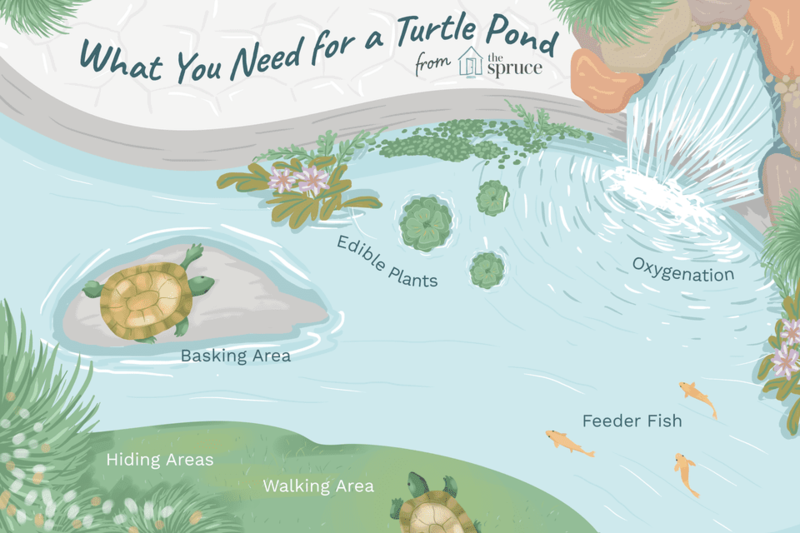 What Does a Turtle Pond Need? Basking area: This is very important. You must provide a log, plank, bricks or rock for the turtle to get out of the water and bask in the sun. Arrange your basking area so it is partially submerged so your turtle can easily get out of the water onto the basking area. The basking area should get sunlight for a good portion of the afternoon. Land Area: Turtles do like to get out for a stroll, so include some land around the pond in your fenced area. Hiding areas: Provide hiding spots and shaded areas both in the water and out of the water. Large leafed plants (aquatic or on land) work well, as do clay plant pots placed on their sides. Plants: Keep in mind turtles can do a lot of damage to aquatic plants (both by eating them and swimming around them), so if your pond plants are a source of pride, adding a turtle to your pond might not be the best idea. However, water plants provide shade and shelter as well as extra food so they are a great addition to turtle ponds. Water lettuce, water hyacinth, fairy moss, anarchis or fish weed (sometimes called Elodea), Cabomba, and tape grass are recommended. Marginal plants like dwarf cattails, dwarf rushes, and dwarf papyrus also help naturalize the pond edge. Oxygenation: The levels of oxygen in the water can be improved by the addition of waterfalls, fountains, external filters and airstones. This is especially important in cold weather. What About Fish? One great advantage to larger ponds is that you can add feeder guppies and goldfish and your turtle can keep busy hunting. However, if you prefer ornamental fish like koi, caution is warranted. Some turtles are quite avid hunters and may even try to nibble on larger fish which can cause injuries to them (especially fins and tails). It is somewhat individual, as some well-fed turtles won't bother chasing fish, while others have a stronger hunting instinct. Also, water quality can be harder to control with turtles in the pond, which can affect the fish. Pond Size: To successfully overwinter turtles, a deep pond with a large surface area (offering the best exchange of oxygen) is necessary. A hibernating turtle needs at least a foot of water that isn't frozen at the bottom of the pond. The pond must also have a large surface area to facilitate sufficient oxygen levels in the water. Aquatic turtles usually settle into the sediment at the bottom of a pond to hibernate and switch to absorbing oxygen through the skin, so the levels of oxygen in the water must be kept high enough. Oxygenation: Since hibernating aquatic turtles require high oxygen levels in the water, some method of adding supplemental oxygen is a good idea. Running a pump (to keep water moving) or air pump can increase oxygen levels in the water. Water De-Icers and Heaters: Pond supply companies usually sell submersible heaters which can be used in the pond during winter. De-icers will usually prevent the pond from totally freezing over, which can help with oxygenation as well as make the pond safer. A water temperature of around about 50 F seems to be the best for hibernation. Avoid heaters that raise the temperature much above this as a cold and inactive turtle that is not at a low enough temperature to hibernate is likely to be severely stressed. Someplace to Dig: As mentioned previously, aquatic turtles in the wild usually submerge themselves in sediment at the bottom of a body of water for hibernation. Make sure there is something on the bottom of the pond such as a layer of leaves to give the turtle something to dig into for hibernation. Some people even put a pan of sand or sand and soil mix at the bottom for hibernation. Too much decaying plant matter can negatively impact water quality though, so be careful about having too much. Prepare the Turtle: Only healthy, strong turtles should be hibernated. Turtles should also have been in the pond since at least mid-summer to have time to adjust to the changing season to prepare for hibernation, and they should be older than six months. As the weather cools, the turtle will eat less and less which is normal. As the turtle stops eating and the temperatures approach 50 F, stop feeding. Is Your Turtle a Boy or a Girl?